Selenite, Desert Rose, Satin Spar and Gypsum Fower are the four varieties of the mineral Gypsum. The four groups of the beautiful crystalline varieties of the Gypsum mineral are largely grouped together and called Selenite. Selenite is composed of calcium sulfate dihydrate, which means that it has two molecules of water. 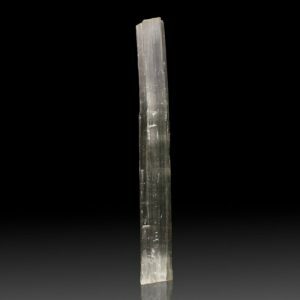 People often confuse Selenite with selenium, believing that it Selenite contains selenium, but that is not the case. 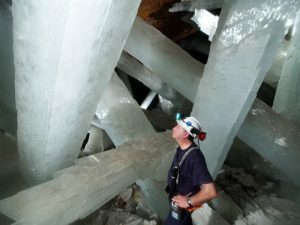 The largest know crystals ever discovered are Selenite and the largest specimen found in the Naica Mine’s Cave in Mexico is 39 feet long and weighs 55 tons. Wow! 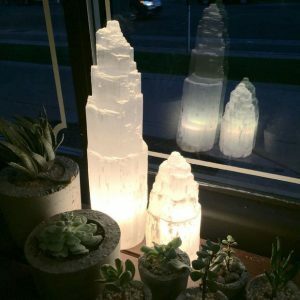 The etymology of this rather mystical mineral comes through the Middle East Selenite, from Latin Selenites and from Greek Selenites (lithos), which literally means moonstone or stone of the moon…Selene (Moon). 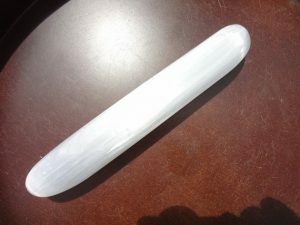 The most common type of Selenite that we see for sale is called Satin Spar. It has a silky, fibrous and translucent quality. It appears rather pearly and slightly milky. This is the Selenite that I love and feel drawn to. Satin Spar Selenite is not very hard. As a matter of fact you can sort of peel it off with your fingernail. It is layers and layers of delicate crystal and has natural thermal insulating properties, feeling cold to the touch. Satin Spar Selenite conducts light through its iridescent layers in a way that no other crystal can do. I find it a very absorbing experience to peer into a piece of Satin Spar Selenite. The decorative value alone stands out in a room full of other stones and crystals. It’s unique pearly opalescence and wonderful optic qualities in the shape of a wand are often referred to as a natural light wand. 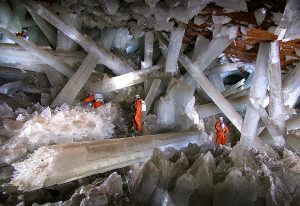 Selenite (Gypsum) is found on every continent and is the most common of all the sulfate minerals. It is often found with other minerals such as copper ores, sulfur, sulfides, sliver, iron ores, coal, calcite, limestone, dolomite and opal. Although Satin Spar Selenite can be fashioned into shapes such as spheres and wands, it is at its best in its natural form. The healing qualities of Selenite have long been known and the ancients believed that it waxed and waned with the moon. Selenite is a true energy conductor. 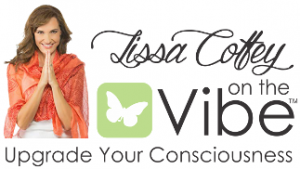 It is a mental stimulator and aids meditation, telepathy and spiritual grounding. It is also known as the Stone Of Atlantis. It releases negative energy and is one of the few crystals that do not retain negativity. It is often used to clear and reprogram other crystals. I find it particularly powerful for clearing and reprograming if used in the light of the moon. Its fine, thin opal like sheets seem to layer their way into the emotional self, mending old wounds and releasing an imprisoned mind. If you go looking for a piece of Satin Spar Selenite, choose carefully. Make sure that you spend some time with it. It generates quite a lot of subtle, healing energy. Stand and look at it. Touch it. Don’t be embarrassed to stare. 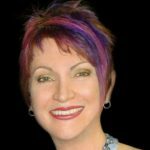 I assure you that it will call out to you if it is what you need. Then place it somewhere that you can see it and pass by it a often. If you meditate, which I hope you do, hold the Selenite out in front of you with both hands. Look into it. Let it help clear your mind. Take two or three deep breaths. When your mind feels relaxed, open and clear lay it down on your lap and continue your mystical journey. Who knows where it will take you.